The newsroom where I used to work was staffed primarily by twentysomethings with journalism-school loans and journalism-industry paychecks. We were a spirited bunch who lived by the work-hard/play-hard maxim, in which the play-hard portion usually amounted to cheap pitchers of beer or happy-hour Jameson shots on Fridays. When it came time to organize an office holiday party a few years ago, no one had the extra December funds to do anything lavish. So we had a dip party. And friends, it was the best holiday party ever. 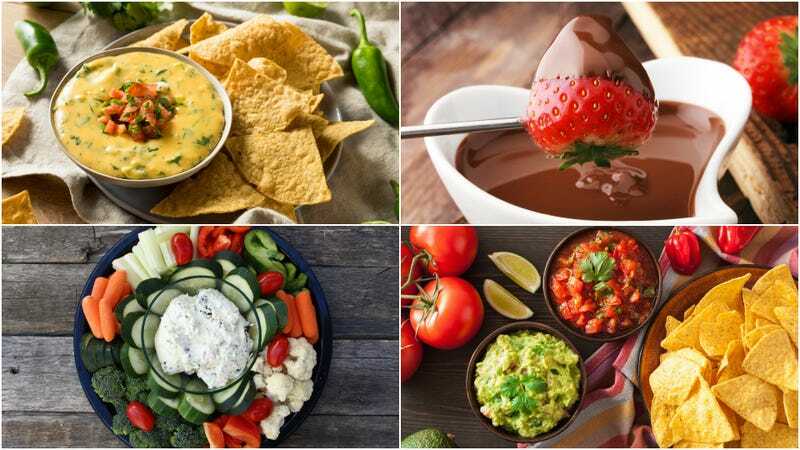 Each employee was instructed to bring a dip, which—when you begin to fully contemplate all the richness that comprises the dip rainbow—includes a wide swath of spreadable and semisolid foodstuffs: queso, seven-layer, French onion, beer-cheese, spinach-artichoke, guac, salsa, tzatziki, fondue, hummus, buffalo, cheese balls (allowable as per our dip-party rules), and a similarly broad range of dessert dips. Someone even made hot crab dip, a bold gamble that paid off when it turned out no one in the office had a shellfish allergy. It was a blast. We each signed up in advance to provide a type of dip (to avoid two dozen versions of salsa), then dutifully commuted to work with our Tupperware bowls and attendant Triscuits or potato chips. Unless a person volunteered to make something pricey like the seven-layer dip, most of us probably spent about $10 assembling our creations. The results belied their meager price tags. With our pooled, crumpled dollar bills, someone bought some Solo-cup beer, and our group of a few dozen coworkers revolved around the conference room, sampling dips and marveling at the Epcot-esque cheese ball and trying to find enough outlets to plug in all the hot-dip Crock-Pots. We held a vote for the favorite hot dip, favorite cold dip, favorite dessert dip, etc. The winners later shared their recipes, and we tossed around fond memories of family members and friends from whom we’d learned our respective dips. Please steal this idea for your own holiday gatherings! It’s a hit for so many reasons, not least of which is the relatively inexpensive nature of the potluck dishes. Dips are also nearly idiot-proof, leveling the playing field between expert cooks and the culinarily challenged among your group. No matter your attendees’ skills or backgrounds, there’s probably a dip that incorporates their favorite ingredients or type of cuisine. I can’t say the all-dip party will do wonders for your cholesterol, but for a morale-booster, it’s unbeatable.